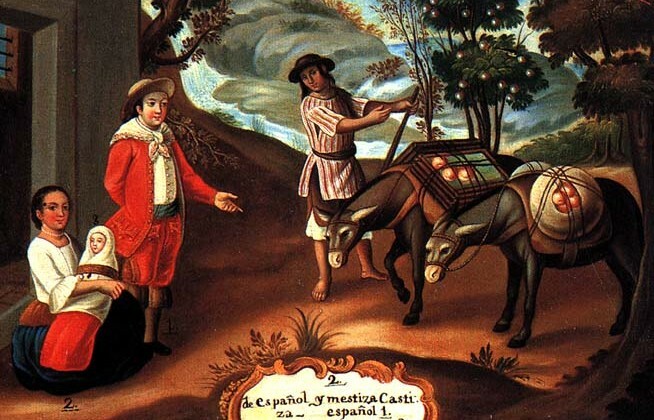 Focusing on the years between 1300 and 1825, this course charts the history of Mexico, Central America, and South America up to the era of political independence from Europe. We will focus on the cultural, social, and economic history of Latin America and, necessarily, on the indigenous, Iberian, and West African societies that shaped it. As we will do this we will use primarcy sources to understand how historians describe the past. Our readings reflect the ongoing “revisionism” that is an essential aspect of historical thinking. I expect you to be in contact with me via the Blackboard email system about any questions or problems you have. The discussion boards are also a good place to raise general questions or concerns and I may put my answers there as well. I expect you to keep up with the weekly pace of the class. Each week, starting on Monday, is a new unit in BlackBoard, where you can find links to the lectures, quizzes, and discussion boards. I expect you withdraw from the class if you find that you can’t keep up with the course for any reason. If you find yourself in this situation, the sooner you drop, the better for your finances and transcript. If you are one of the Show-N-Tell leaders for a given week, I expect you to post your materials or link to that week’s discussion board before 8am Monday of that week. I will answer your email within 24 hours if you label it “4366”. I’ll give you ten days–Monday through Wednesday–to complete the discussion work and take the unit quiz on the lectures. For example, the assignments for a unit that starts on Monday, September 1 will be open until 11:59pm Wednesday, September 10. Once the deadline is past, you’ll be locked out. I will let you take the weekly quizzes twice, counting the highest score. Individually these quizzes are not worth a lot, but they are designed to prepare you for your country projects and to reinforce the material in the lecture. I will give you extensions of a few days for our country projects and final project IF you are keeping up with the quizzes and discussion. I will give you detailed feedback on your country project based on the grading rubric. On subsequent projects you can expect me to grade you on whether you used my feedback to improve your work. I will be glad to meet you in person! You are welcome to drop by during my on-campus office hours but I may have another appointment. Making your own appointment with me is the best thing. If you would like to meet in person but can’t come to office hours, send me a message and I’ll try to find a mutually convenient time we can get together on campus. Computer equipment: I highly recommend that you have broadband access and a traditional computer/laptop as opposed to a cell phone or IPad. The course lectures are delivered in a variety of video formats and may not always work on some portable devices. The Blackboard on-line quizzes are NOT guaranteed to work on these portable devices either. On a weekly basis, you’ll read one of our four books and watch on-line lectures in screencast format. Some of the lectures will review important or difficult elements of the reading, and others will go deeper into historical topics. The lectures are NOT substitutes for reading the books, but are designed to help you get more out of them. You’ll have about 30 minutes of screencast lectures to watch every week, with a weekly multiple-choice quizzes on the content. You’ll be able to take each quiz twice within a 9-day window. Your highest score will count. For four weeks during the semester, you will be assigned to read the materials and do the exercises on a website called World History: Unpacking the Evidence. [http://chnm.gmu.edu/worldhistorysources/whmunpacking.html] One week, for example, we will do a unit on using images (paintings, photographs) as primary sources. Another week the unit will be about using official documents. “Unpacking the Sources” will train you in the historical skills you need for your Show-N-Tell assignment. There will be a five-question multiple-choice quiz on these materials during each of these four weeks. And for each of those four weeks the Unpacking the Evidence site will be the basis of our weekly discussion. In week one you will pick one of the four types of primary sources [images, maps, official documents, and personal accounts] we will cover in “Unpacking the Evidence.” Then you will sign up to do an SNT, analyzing an example of that type of primary source, using the skills we will learn from “Unpacking the Evidence”. The course schedule shows when each of the different primary sources has its SNT week on the discussion board. You will choose your specific primary source from a list I will provide. For example, if you choose to do your SNT on an image, you would select an image from among those I supply on Blackboard. Then on the Monday that begins Week 3, all the image people will post their image on the discussion board, along with a critical analysis of that material. I will supply you will a detailed template for this analysis. During week 3, all the other students in the class will review and critique the image analyses posted for these SNTs. Part of your SNT grade is based on how active and responsive you are in the class discussion of your post during that week. In week one you’ll choose one Latin American country. During the semester you will write three five-page papers about that country. These “Country Projects” will ask you to explain and illustrate how themes from our assigned book can [or cannot] be seen in the history and culture of your country. Some countries cannot be chosen for a Country Project because they are too difficult to research. These are Belize, El Salvador, the Caribbean islands, Costa Rica, and Panama.